South Asian region, is considered one of Sri Lanka’s most established artists. 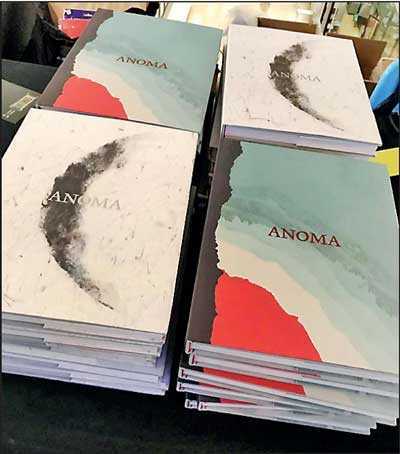 The monograph, which was in the making for seven years, was simply titled ‘Anoma’, and was written, designed, and produced by a group of writers, academics, editors, and art directors from around the world. It lends an intimate view into the life and work of the artist, hinting at the elements that shaped her ideas, thought process, and art. The monograph showcases fifty years of the artist’s paintings, installations and designs alongside five essays by writers from Sri Lanka, India and the UK. There are over 250 images of her art, photographs from the artist’s life and a comprehensive section on process and chronology. The CEO of Colombo No. 7 Gin—sponsors of the book—Amal De Silva Wijeyeratne summed up the significance of celebrating Anoma with this monograph saying “...in their never ending quest for excellence they create for us, things that make this world and bit more beautiful and special and inspire us…along the way; when we find those rare few, we should cherish and celebrate them.” The launch was attended by some of London’s leading art academics, gallerists, designers, creative consultants, and invitees, who came from Europe and across the Atlantic from the USA. Professor Emerita Jane Rapley OBE, former Head of College at Central Saint Martins (CSM) and Pro Vice Chancellor of the University of Arts London (UAL) spoke at the launch and commended Anoma’s transformation from a ‘wild child’ during her university years, through being a successful textile designer to becoming the artist that she is today, voicing and painting her thoughts on profound problems facing this world. Chris Sanderson, co-founder of UK’s leading trend forecasting and consumer insight consultancy ‘The Future Laboratory’ also spoke, and described Anoma’s formidable energy and force as a painter and a person. He also mentioned how her art sits at a “fulcrum between abstract emotional engagement and political awareness”. Also speaking was Jana Manuelpillai of The Noble Sage Art Collection. As Jane Rapley pointed out, the monograph launch being held at Central Saint Martins’ two hundred million pound building at Kings Cross, completed the “full circle of Anoma’s journey in art, which started at CSM.” The college, established in 1869, is part of the University of the Arts London, which is the largest provider of creative education in Europe. CSM has been called the Oxbridge of Art and Design and its successful alumni range across many disciplines from artists Anthony Gormley, Richard Long to fashion designers Alexander McQueen and Stella McCartney; from actors Michael Fassbender, Pierce Brosnan and Gwendoline Christie to singers M.I.A and Paul Simonson and industrialist Sir James Dyson; as well as Sri Lankan politician Mangala Samaraweera, and of course, Anoma herself. 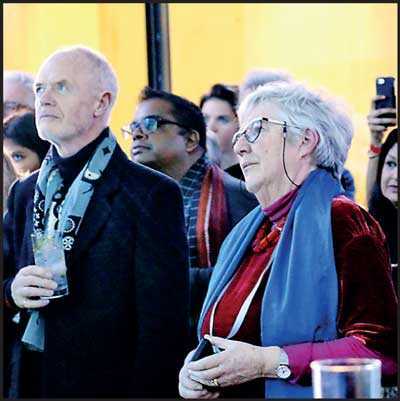 The eminent group of writers behind the ‘Anoma’ monograph include Professor Emeritus Gananath Obeyesekere, Princeton University, USA; and Professor Emerita Jane Rapley, who has undertaken education and business development consultancy work in UK, China, Sri Lanka, Hong Kong, and Italy since her retirement. 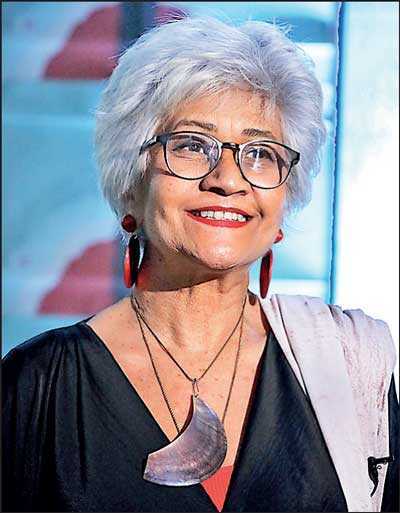 The New Delhi-based art writer and former editor-in-chief of Blouin Artinfo India, Rosalyn D’Mello, also contributed to the monograph. D’Mello is a regular contributor to Indian Vogue, Art Review, and Art Review Asia, and was nominated for the Forbes’ Best Emerging Writer award in 2014. An essay from Jana Manuelpillai of the Noble Sage Art Collection completes the monograph. 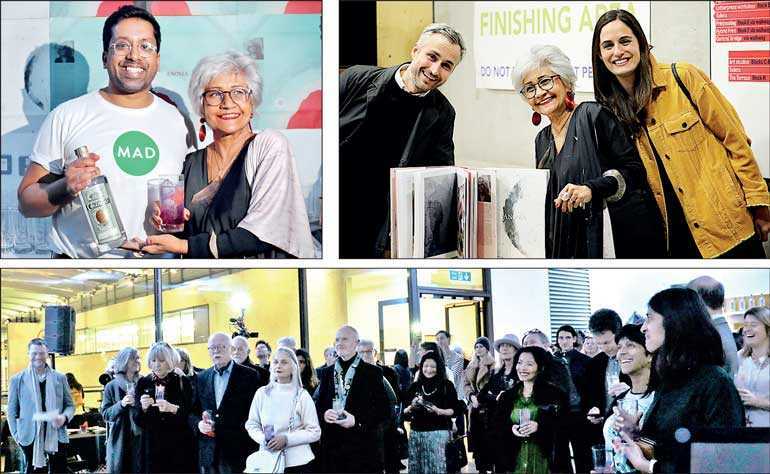 Manuelpillai, who has been promoting contemporary art from South Asia since 2006, became lead art dealer and gallerist for Anoma, drawing in new audiences to her work. ‘Anoma’ also includes words and editing by the Sri Lankan writer Richard Simon. Designed by the London-based art direction and design studio Micha Weidmann, the book was introduced by the designers as “a monograph designed to feel relevant for today, and years to come.” The studio stated that it was honoured to have designed the book for Anoma, and looked to simulate her expressive body of work in a structured yet dynamic way. “The larger introduction texts and extracts allow the reader to understand her inspirations and views vividly allowing the reader to connect to her art,” they said. The studio’s creative approach is based on Micha Weidmann’s background in Swiss design and art direction defined through working with brands such as Prada, Tate Modern and Zaha Hadid. A highlight at the launch was the delicious cocktail mixed by the world’s most awarded bartender—Ryan Chetiyawardana—especially to celebrate ‘Anoma.’ The cocktail was based on Colombo No. 7 Gin, and incorporated the artist’s most treasured tastes from her childhood in Sri Lanka, and later life in London, leading to a drink equally complex and flavoursome. This produced a signature concoction with Sri Lankan spices to light fruit flavours from coconut, butterfly pea powder, curry leaf, cinnamon, lemongrass, kalamata olives, and red pickled star fruit. Chetiyawardana is a Sri Lankan mixologist who won critical acclaim and recognition as one of the world’s most pioneering bartenders; his bar just won the best bar in the world 2018 and Chetiyawardana was rated among London’s top 100 influencers. He named the cocktail ‘Anoma’. For both Anoma and Colombo No.7 Gin, this collaboration was an opportunity to draw parallels between the process of art making and the creation of a very special artisanal gin—where both are a pursuit of excellence. For the last twenty years Anoma’s art has posed hard questions for her viewers about some of the most compelling and urgent issues of our time—those of sustainability and inclusivity. Her passionate concern for the future of our planet, her love for the environment and her belief that only with tolerance of diversity and generosity of spirit will peace be sustained in this world, have fuelled the message of her work. Over this period, her art has been exhibited in many international cities (including London, New Delhi, Dubai and Sydney) incorporating video and sculpture, and including collaborations with poets, writers, composers, performers, activists, and developmental and environmental experts. After many group and solo shows, in 2016 she represented South Asia, when her work was included in the ‘One Belt One Road’ exhibition at Sotheby’s Hong Kong. The monograph is now available at the cult designer store Egg in Belgravia in London, and is soon to be released in Colombo.